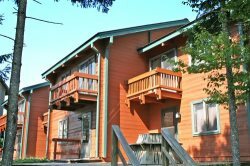 Creekside E18 - Creekside Crib is the perfect location for your family vacation! This beautiful 4BR/4BA townhome is in the quiet Creekside Villa at Silver Creek. It is walking distance to Silver Creek for skiing and snow tubing. It has a gas fireplace, 2 living rooms, a large heated gear room at the main entrance, fully equipped kitchen, TV’s in all the bedrooms, and a private hot tub. Catch the shuttle at the bus stop located at the main entrance to Silver Creek or Snowshoe.